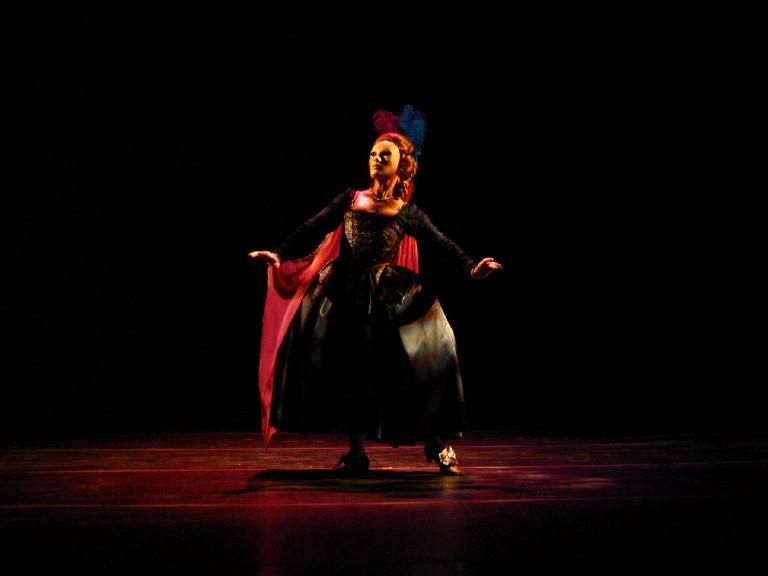 Armide goes to Summer Camp | The New York Baroque Dance Co. This August I had the pleasure of performing “La Passacaille d’Armide” for the Faculty Gala at Bates Dance Festival in Maine. It was a debut for my costume, inspired by one of the NYBDC’s costumes and built by Lisa Marzolf, with a new mask, painted by William J. Totten. A dramatic, Baroque solo was new for many people in this audience. From their comments, I discovered that most people kept their focus on only one aspect of the dance – the hand gestures, for example, or the foot work. People had rather strong reactions to the mask. Some people found it “creepy” while others said they were amazed at how lifelike it seemed to become. The dance was placed in between a duet by Kathleen Hermesdorf and Albert Mathias and a solo by David Dorfman. Again, some people found this a strange mix, but others thought it was “perfect.” I love doing this solo and was very happy to be able to introduce it to a new crowd. This is really interesting, will Armide go to camp next summer?